﻿﻿In studying ceramics I have always been fascinated by the complex problem of integrating three essential elements of ceramic design: form, surface, and function. My forms are a wheel-thrown mixture of the mechanical and the whimsical, flowing lines and hard edges, with many pieces altered after they come off the wheel. The surfaces are then treated as a blank canvas. Rather than dipping or pouring glazes, I like the control of a sprayed surface where I can blend colors softly or create graphic shadow images using drawn and cut stencils. 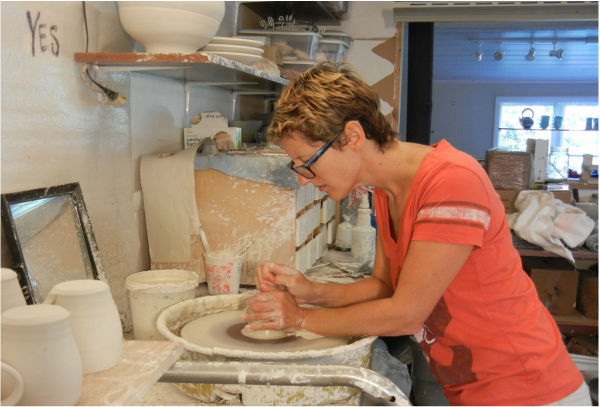 Kary Haun has taught art, sculpture and ceramics for more than fifteen years. She has worked professionally as a potter, and as a designer. She received a Bachelor of Fine Arts from East Carolina University. Currently, Kary is working exclusively in Porcelain, and firing in oxidation to 2200°F in her Log House Studio in Woodstock, VA and works part time in the County Tourism Department promoting the community she loves. She also serves as Treasurer on the Board of Directors of the Artisan Center of Virginia, a statewide organization committed to promoting local Artisan communities and culture. Visit www.artisancenterofvirginia.org for more information.